Hanging out with Our Players. Checking out Ryan Zimmerman's Rawlings Gold Glove and Louisville Silver Slugger Awards. Catching up with some friends at Nationals Park that we haven't seen since the end of the 2009 Season. Having an entire Photo Station in the late 2PM Hour all to ourselves to tell jokes with Our Manager Jim Riggleman and Pitcher Jason Marquis. Good Stuff too. The unexpected highlight of the day. And hearing News Commentator & Pulitzer Prize Winning Journalist, George Will, call Team President Stan Kasten "A Bolshevik--in fact a communist" in the final Q & A Session when Mr. Kasten stated that he was not opposed to some extended use of Instant Replay in Major League Baseball. Especially when Stan Kasten replied: "I've been called worse!!" Tore the house down--everybody busted out laughing. Our Team President can give out as good as he gets. Fun Stuff and that's what NatsFest 2010 turned out to be. The opportunity to meet some of Washington's players, take a photo, get an autograph or ask a question--all in a baseball setting. For nearly five hours this Sunday, a few thousand fans showed up at Nationals Park to take in the festivities. 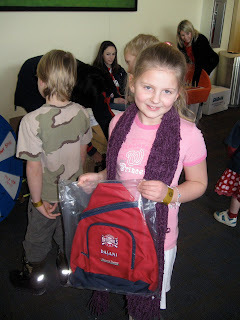 10 different venues were active and everyone had to choose their activities wisely to make the most of the afternoon. 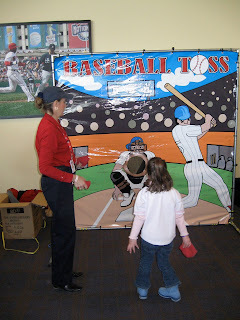 Three Photo Stations, Two Autograph Stations, Visit Our Washington Nationals Clubhouse, Take a few swings in The Batting Cages, Questions & Answers with Front Office Staff in The Red Porch Restaurant, MASN Grip & Grin--along with the Kids Zone located in The Conference Centers. Pretty well organized--at least for our desires. The photo stations moved rather efficiently--even Ryan Zimmerman's (and he did two set ups today). When The African Queen and I entered The Z-Man's first photo opportunity in the 1PM Hour, we were a few hundred back in line and we still made it to the front in about 20 minutes. Staff was moving everyone through. but it wasn't overly rushed. There was enough time actually to have a brief conversation. Our big thing is the photos (can you tell?) and we easily took shots with Tyler Clippard & Josh Willingham, Matt Capps & Craig Stammen, John Lannan & Nyjer Morgan, Riggleman & Marquis and Ryan Zimmerman at NatsFest. The Visitors Clubhouse was the best venue for picture taking. The Locker Room backdrop with Nationals Batting Helmet and a couple of bobbleheads framed a more natural lighting set--which made for really good flash photography. The Press Conference Room Photo Station has compact florescent lighting and doesn't work as well for getting that crisp picture shot with your basic digital camera. Not bad by any means--but not as good as The Locker Room Set. One complaint--The Fan Photo Guys taking pictures for profit at the Photo Stations sort of get in the way. They are so determined to get their pictures taken first that many fans feel intimated and believe they aren't allowed to take their own photo. Many times, it leads to The Fan Photo Guys & a family member/friend taking photos at the same time. Invariably, you can bet, many will end up with one person looking at one camera and others looking at the second camera--at the same time. We have. It's very awkward and it slows down the line at times. It really does. Zimmerman's Rawlings Gold Glove & Louisville Slugger Awards are huge. They were displayed on two tables in Presidents Club. Really nice to see and enjoy in person. Sohna and I actually visited them twice. 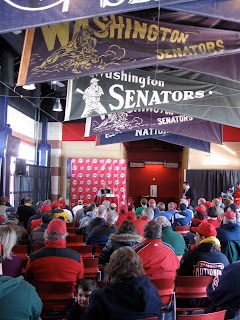 Once as our first stop today, then as NatsFest was winding down later in the afternoon. We are not much into autographs, but some friends told us that it took approximately 40 minutes to get through any particular signing line. 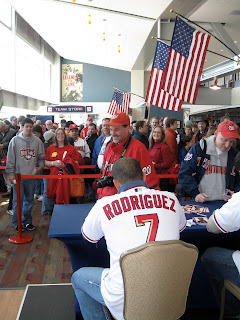 As it turned out, this was the only way for attending Nationals Fans to meet Ivan Rodriguez. "Pudge" did two one- hour signing sessions for his only appearance during this past week's Winter Caravan & Hot Stove Luncheon & NatsFest. Brian Bruney also only signed autographs. 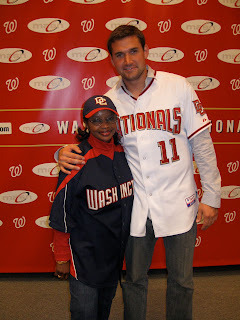 Ryan Zimmerman only took pictures. Clippard, Willingham, Capps, Stammen, Lannan, Morgan, Riggleman & Marquis all signed autographs and posted up for pictures with fans. Approximately 200 fans (for each session), who signed up in advance at The Exxon Kids Zone under Garage C, where allowed entrance to The Red Porch Restaurant for the five Q & A's. Our General Manager Mike Rizzo led off the 30-minute sessions and was followed by Riggleman, then Mr. Kasten, George Will & finally--Rizzo, Riggleman, Kasten & Will joined ESPN's Baseball Correspondent Tim Kurkjian in a final wrap up session that was very lively and entertaining. That's the only one we attended in full. A few fans mentioned to us they were disappointed the Q & A's had filled up to size capacity before they even had a chance to get their names down. But we did notice that one such gentleman later had made it in for a few sessions after those who had signed up earlier--apparently didn't actually show up. Everything had worked out for him--eventually. The Washington Nationals Dream Foundation was selling game used and past player memorabilia in The Presidents Club and auctioning a Stephen Strasburg signed jersey. $20 autographed Bats, $10 to $15 Dollar signed baseballs and $50 Jerseys. The African Queen and I picked up a Red Curly "W" authentic Manny Acta uniform top. The Kids Zone in Conference Center Rooms 3 & 4 was packed!! Moon Bounce, Face Painting, Spin The Wheel for a prize, Baseball Toss and, of course, My Best Friend!! Screech!!! 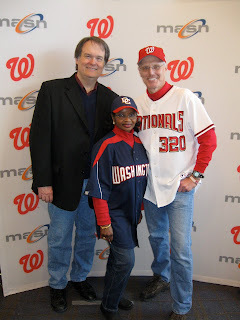 We got a total kick out of the MASN Grip & Grin because when we walked in--who's taking pictures with fans? Phil Wood!! Cracked us up. Just about 20 minutes earlier, Sohna and I had been chatting with Phil inside The Stars & Stripes Club. We see and chat with him on a regular basis. It was really funny. All of us laughed over the irony throughout the photo taking. 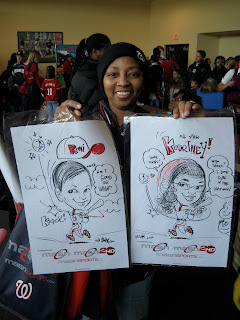 Also in the MASN area, fans could have caricature drawings made by a local artist. Funny story of the day. 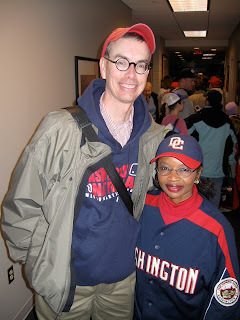 We ran into Mark Strattner--The 10 Millionth Fan in Our Washington Nationals history. 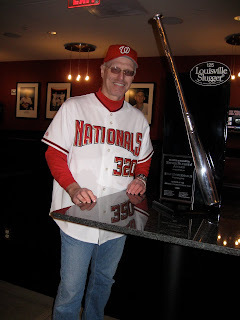 You may recall in 2009, he was honored with a Ryan Zimmerman autographed jersey, Presidents Club Tickets, other assorted goodies and an actual seat from Nationals Park engraved with his name. Asking Mark where's the chair finally situated now? He responds: "I am the most popular person in my office (it's displayed at his work place). I sit in it during meetings. Everyone wants to sit in it. People are constantly coming over, and stopping by. I am the most popular guy at work. So much so, I have to lock my office door at night to make sure it doesn't get stolen!!" Mark Strattner told the story so well at the time, he had everyone standing in line with us awaiting pictures with Lannan & Morgan--enthralled. As everyone exited The Visitors Clubhouse after taking pictures with our players, fans came across a The Visiting Clubhouse's Weight Room displaying autographed jerseys of some of the greatest players in recent history including: Greg Maddux, John Smoltz, Nolan Ryan, Gary Carter, Trevor Hoffman, and Tommy Glavine among the nine hanging on the walls. 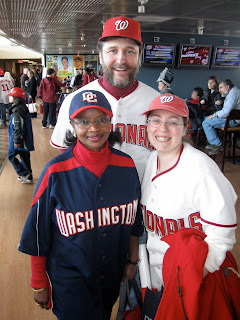 Finally, many thanks to quite a few folks who stopped Sohna and I along the way today to thank us for the effort we make and the fun we have to cover Our Washington Nationals in a very unique and original way--including Shoshana and Michael. 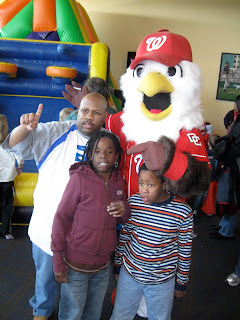 Overall, we had a wonderful time at NatsFest 2010. 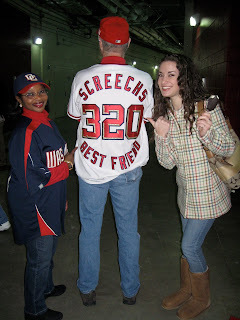 Things moved more smoothly than in 2009--during the 1st NatsFest. For Season Tickets Holders, it's a free event and nice way to finish off four days of local Winter Caravan Stops and the Hot Stove Luncheon. Much cooler than the the outside temperature. 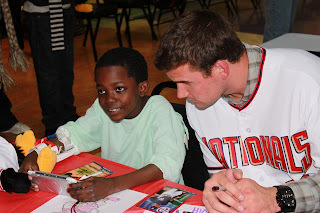 For the second year in a row, Our Washington Nationals spent the final day of The Winter Caravan touring a facility close to our team's heart. Maybe, the most important visit of the entire week's activities. 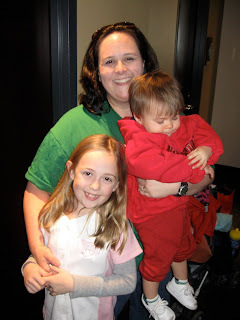 In 2007, The Children's National Medical Center in N.W. 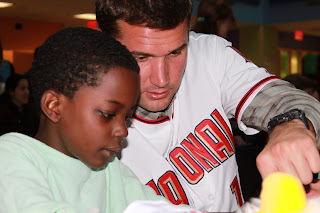 Washington was chosen by The Washington Nationals Dream Foundation as recipient of one of their core community projects--a Juvenile Diabetes Care Complex. $5 Million dollars is needed to complete the project. The much needed children's center was kickstarted with a $2 Million donation by The Dream Foundation three years ago. Unfortunately, $3.75 Million is needed to break ground on the state of the art facility and in a down economy, donations have been sluggish--meaning The Washington Nationals Dream Foundation's pet project has yet to begin construction. But that hasn't kept the spirits high for what can be accomplished. Today, Ryan Zimmerman led Nyjer Morgan, Adam Dunn, Josh Willingham, John Lannan, Jason Marquis, Matt Capps, Craig Stammen, Brian Bruney, Tyler Clippard, Our Manager Jim Riggleman, MASN's Rob Dibble and My Best Friend!! Screech!! 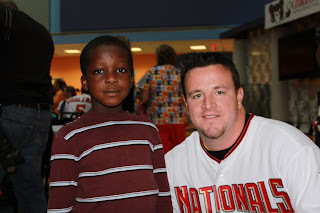 on a special "Meet & Greet" with many sick children in the Atrium of The National Children's Medical Center. A little love and attention never can do anyone harm and on this cold, snowy and dreary winter Washington, D.C. day--13 Members of Our Washington Nationals brought some sunshine back into these needy kids' hearts and left leaving smiles on their faces and the hope--most important of all--that all is not lost. 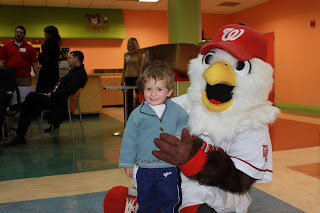 If Our Children are truly Our Future then the construction and final completion of The Washington Nationals Dream Foundation's Diabetes Care Complex at The Children's National Medical Center in NW Washington should be set in stone on a calendar date in the very near future. 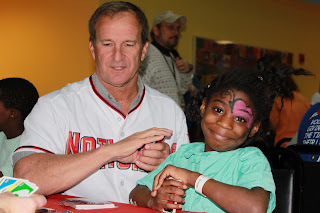 Those children deserve the support and Our Washington Nationals are making every effort to bring a healthy future back into their lives and to the many families that love them--unconditionally. Three different Bobblehead Days headline Our Washington Nationals 2010 Promotional Schedule. Ryan Zimmerman, Nyjer Morgan and a third "Fans' Choice" will be given away by PNC Bank at Nationals Park according to Washington's Pocket Schedule handed out this week by Nationals Staff attending The Winter Caravan Events and The Hot Stove Luncheon. Overall, 24 select home games will feature a promotional giveaway and 54 total Nats Games will be tied to a special event. Some old stand-by freebees return including six Tee-Shirt Tuesdays, Cooler Bag, Schedule Magnet, four different baseball caps (including one for kids only) and four more items for children under 12 years of age only: Tee-Shirt, Backpack, Back-To-School Supply Kit and a Batting Helmet. Additionally, some new giveways for 2010 include a Water Bottle, Travel Mug, Beer Pitcher & Cup Set (for those over 21 Years Of Age) and a Knit Beanie. The Zimmerman Bobblehead--his second given away by Our Washington Nationals--will take place on June 19th when The Chicago White Sox visit Nationals Park. Nyjer Morgan's Bobblehead handed out on July 31st when The Philadelphia Phillies are back in town. And The Fans' Choice Bobblehead (details yet to be announced) is scheduled for August 28th when The St.Louis Cardinals return to The Nation's Capital. Each of those three days are Saturdays and each bobblehead is limited in production and given to the first 15,000 in attendance those evenings. All Promotions & Events Subject To Change. One Promotional Item Per Person, Per Ticket--Based On Availability. Friday Night Fireworks return to Nationals Park after any scheduled home game for the third consecutive year. Two Ladies Nights on June 10th and August 26th too. Jackie Robinson (April 16th) & Roberto Clemente (September 9) Days are back, as well as, Black Heritage Night on July 2nd and Hispanic Heritage Night on September 10th. College Super Saver Night: 50% Off ALL TICKETS above $10 for any Monday through Thursday non-premium game in APRIL & SEPTEMBER ONLY. One Ticket per College ID. Available only at the box office on game day. Active Military Members, Senior Citizens, Government Employees & College Students can receive $3 off all regularly priced tickets valued at $10 or more for ANY non-premium home game. One ticket per ID. Available only at the box office on game day. Harris Teeter Vic Card Holders receive $5 off all Tuesday Home Games for tickets valued at $24 or more. Four tickets allowed for purchase per Vic Card. Available only at the box office on game day. Bring The Wednesday Washington Post Front Page to the box office for any Nationals Game scheduled on that very day and receive $5 off any ticket valued at $24 or more. Two tickets per Wednesday Post. Available only at the box office on game day with that day's printed Washington Post. Every Thursday & Friday Night at Nationals Park is now Miller Lite Party Night. Pre-Game Party at The Miller Scoreboard Walk, ticket to that day's game in the scoreboard pavilion and a drink voucher for $20 ($22 for premium games). 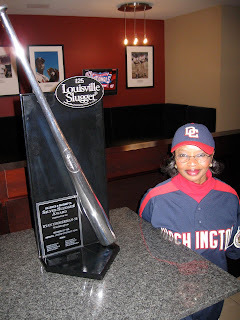 And finally, Signature Sundays return at Nationals Park in 2010. Before all Sunday Home games beginning at 12:15PM, Nationals Players will sign autographs for fans for approximately 20 minutes.